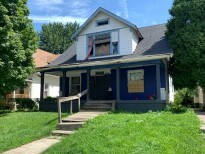 View - 1215 N LaSalle St.
Large home in need of repairs, but priced to allow for that in the budget. Huge covered porch overlooking neighborhood in redevelopment area. Good size upstairs living area for family.